As many financial districts shows, tall glass buildings are the fashion of contemporary architecture. Yet, is it just a trend? Indeed it isn't. The shiny look of these ‘glass towers’ is actually the result of several structural solutions behind them. Together with glass, aluminium is a key component in these structures thanks to its high-strength, low-weight properties. Aluminium profiles are to be shaped in order to be employed in constructions. Profiles are manufactured from aluminium blocks through extrusion. Large metal blocks are pushed through a hollow die and forced to take the die’s shape, thus creating the profiles needed. They can then be used for a wide range purposes, such as sliding doors, window frames, architectural hardware, curtain walling and –indeed- as part of skyscrapers’ structures. Overall, aluminium is very efficient for light management, it provides good insulation and it is an easy-to-clean surface as well. Strengthened aluminium alloys can support even larger glass structures. Perhaps, the most used alloys today are the 5000 and 6000 series. The latter especially, made with Magnesium and Silicone alloys, seems to be particularly easy to extrude while keeping the metal’s strength. Even stronger alloys –instead- are used for gridshell structures -increasingly built for expositions, pavilions, stadiums and sport centres. In other sectors like roofing, cladding and prefabricated buildings, aluminium panels are more frequently used. In this case the metal block is flattened, cut, folded and shaped according to the structure’s needs. Aluminium panels require a small amount of joints, thus being fast and cheap to install. Such practice is very common for facades and ceilings as aluminium is extremely suitable for outdoor purposes. When exposed to air, aluminium naturally forms an external oxidised layer to protect the inside from the elements. This process can even be enhanced by anodizing the metal. Anodazation is an electrochemical process which increases the thickness of the oxide layer. Moreover, the layer is highly porous and it absorbs any colour for decorative purposes. Aluminium wall cladding systems create some of the most interesting buildings today. An example is the Empire State Building, where aluminium was widely used in its construction for the first time in history. Thus, this metal is both functional and aesthetically pleasant. 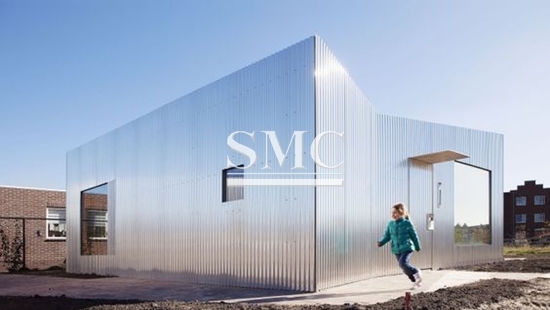 At Shanghai Metal Corporation we proudly supply construction businesses with the aluminium components they need. With over 10 years experience, we manufacture Aluminium Profiles, Extrusions and Beams of 5000 and 6000 series. Among others, Corrugated， Perforated and Tube Ceilings are examples of the roofing solutions we offer. SMC is happy to customize your products according to your request. For more information and a full list of products,please click here.